Select a cartridge size for more information. If you're searching by part number, it's easier if you choose from this list. We stock a very large selection of filter cartridges. If you don't find what you want, please inquire. This is the most common size made in water filter cartridges. It is essentially a drinking water size, though some discount store manufacturers use this size in inexpensive whole house filters. Compatible with our Model 77, Black & White RO and Undersink Filters. This is a favorite size of makers of light-duty whole-house filters both for sediment and chemical removal. This is the popular “Big Blue” size used mainly for light-duty whole house filters. It's a popular size for wells. Most cartridges in this category are carbon blocks and sediment cartridges. This is the popular 20" or double “Big Blue” size used mainly for free-flowing whole house filters. It's a popular size for wells and for residential chlorine removal filters. Available in sediment, carbon block and specialty cartridges. This is the standard threaded cartridge that fits Doulton filters and our own slimline countertop series. We call them “Candles”, as Doulton does, or simply Slimlines. Includes several grades of ceramics, carbon blocks, and sediment cartridges. 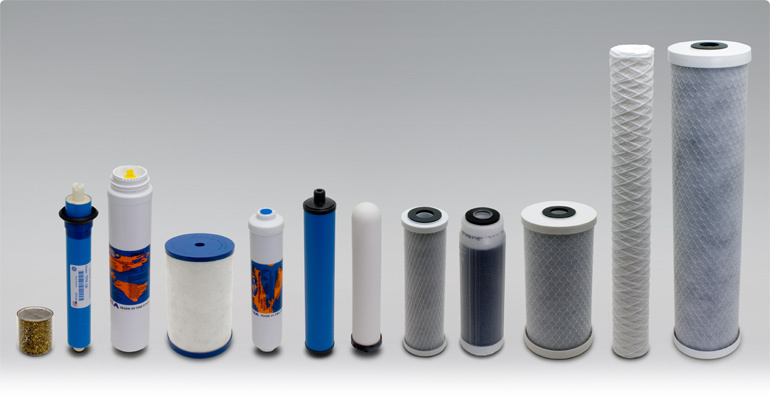 Specialty cartridges for filters & RO units by Hydrotech and Microline. Omnipure's Q Series. We stock mainly 12" sediment and granular carbon models for reverse osmosis and for general filtration purposes, but we also have specialty units for lead removal, scale reduction, and deionization. Many styles and formats of easy-to-install disposable Inlines. We stock open end 1/4" port style as well as the quick connect style. High quality carbon blocks compatible with many Multipure units. Replacement cartridges for the High-Output (HO) and Hand-Held style Sprite shower filter models. We stock a wide variety of membranes for standard membrane housings. Also, some specialty items like Hydrotech and Q Series membranes. Premade cartridge replacement packs for undersink & reverse osmosis units we carry.